In the first week of September 2014 joint forces of Gdansk University of Technology and Rostock University performed one-week of overtopping experiments at the Polish DredgDikes research dike. We have studied the erosion process on a substantially different dike construction, compared to the German research dike, made from sand-ash composite soil. The results of the experiment are being processed now in Rostock and will be carefully studied with respect to stability and erosion resistance. In the meantime the team at GUT continue numerical modelling of flooding scenarios and to make contributions to the “Best Practices Gudeline”. 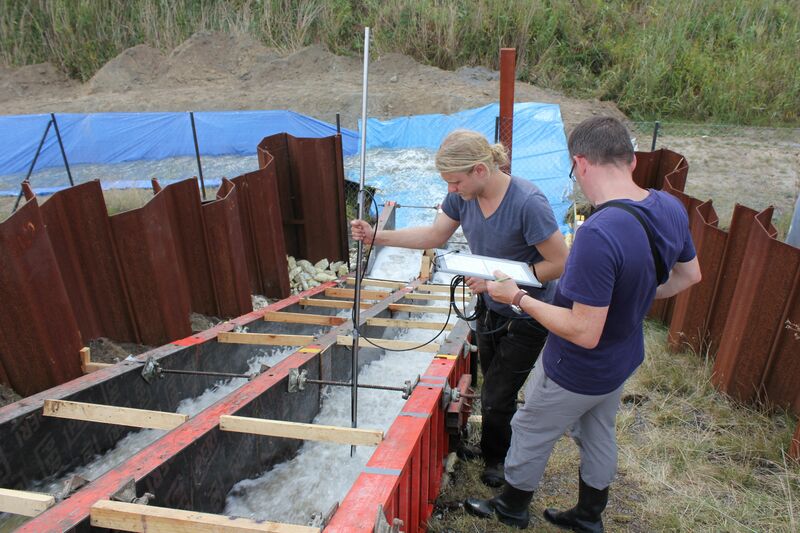 For the overflowing tests, the 60cm flume system was used again. The maximum specific discharge was 500 l/(s*m). The experiments showed that the grass cover, which was applied using pre-vegetated grass sods placed on top of the clay and Tefra slopes, had not clung into the subsoil sufficiently. Thus, during a discharge of more than 200 l/(s*m) the top soil and vegetation was destroyed. The bare clay cover showed erosion after a discharge of 50 l/(s*m) for 10 minutes, while the sand ash mixture performed better, showing only little erosion after 40 minutes of overflowing with discharges up to 200 l/(s‘m). Thus, it can be assumed that after a destroyed grass cover, the sand ash composite would still be stable for some time, however, a good vegetation cover is generally more effective. For a durable vegetation cover, however, a solution other than pre-vegetated grass sods will have to be used.